I went to my first NFL football game a couple of weeks ago in Buffalo. We went to see the Bills “squish the fish” and I had a great time. As we were tailgating the temperature consistently dropped until freezing rain and then snow started falling. It was actually the perfect atmosphere for a football game in Buffalo. I wouldn’t have it any other way. What I would have enjoyed, however, would be a pair of far infrared heated pants. The cargo pants offer 4 hours of heat through low power infrared energy powered by a rechargeable lithium battery. The heating elements are located in the front thighs and waist and envelope the entire lower body as energy is transferred through a flexible lightweight carbon mesh. 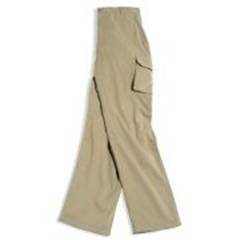 The pants are made of 65% cotton and 35% polyester with a fleece lining and are machine washable. If you are in dire need of heated pants like I was in Buffalo then you won’t mind spending the $139.95 US.